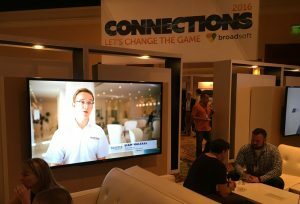 Fourteen IP MD Neil Tolley took part in the BroadSoft Connections partner event in San Antonio Texas this month where industry leaders and market influencers, got together with peers from around the world, to learn about innovative solutions from Broadsoft including the exciting new business collaboration tool Team-One. As well as joining over 1500 of BroadSoft’s service providers in this prestigious event, Neil joined a distinguished panel of guests (pictured above) in a break out session at the event to talk about the Hospitality Sector, “Experience is Everything”. Joining Neil on the panel were narrator and star of the recent JW Marriott case study video, Vice President for Hospitality Solutions at BroadSoft Ron Tarro, Chief Operating Officer at Hotel Technology Next Generation (Htng) David Sjolander and Director and Marketing and Business Development at AudioCodes, Benny Matityahu. Discussion took place on specialised technology solutions required to deliver on the guest experience for hyper-connected travellers and how to engage and collaborate in new ways with guests. The real star of the event was the recent Fourteen IP/Broadsoft case study video from the JW Marriott in Venice, which was played on a loop in the main reception area at the conference, receiving much praise.